Many people have told me that The Sparrow is a book I had to read, and since it's a book that deals with questions of how religious faith affects people's lives I knew they were right. I'd heard varying things about it and knew the basic premise, but that was it. In any case, I chose it as a book to make sure I read this year and I am so glad I did. I had no idea it was such an utterly absorbing book. I started reading and didn't want to put it down, when I had to set it down to go to church or eat, I was dying to get back to it. It's the kind of book that's like an itch that must be scratched, I absolutely had to be reading it. The Sparrow is told in two timelines. It's the story, primarily, of Emilio Sandoz who is a Jesuit priest. He goes to Rakhat, a newly discovered planet on a mission with some other Jesuit priests and specialists. Things, somehow, go horribly wrong. The story starts with a devastated and ruined Sandoz back on Earth surrounded by the authorities of his order trying to get his story of what happened. Some of them are cruel and impatient believing the worst, others more patient and compassionate with the very damaged man. The story flips back and forth between Sandoz slowly revealing his story to the other priests of his order and the story of how he went to Rakhat, who was chosen to go, how they met, and why. This technique is very effective. In addition, I can imagine it's quite hard to accomplish. There are so many characters to get to know and stories to keep straight. Yet there isn't a moment of lag in this book, I loved the whole thing. I loved this book and don't even know where to start with why. I loved the characters. The characterization is outstanding, these people felt real and fresh and funny and true. The kind of people so well drawn I wanted to know them. And I loved, loved, loved their relationship. It's a group of adults who have formed their own sort of family. No children, just people who genuinely love each other's company and support one anther. It's illustrated in so many ways, so beautifully throughout the book and it's hard not to envy this closeness. I mean, they all agreed to go off to another PLANET together! I think loving them is so important because it's essential to understanding why when Emilio Sandoz goes back to earth alone it's so utterly devastating, you read the narrative with a kind of dread, you know their fate even as you are falling in love with them. I also found the storyline of going off to another planet to be very interesting. Russell has explained she was exploring the sort of judgement we put on people of history, as if we expect them to have been able to manage all of our ideas without our knowledge and technology. There was no new land to discover in our world though so what would be the equivalent? I thought of this often while reading, this group of people seeking to understand this new place went with the best of intentions, they had no idea what sort of consequences would occur. But the central question of faith and its role was hard hitting for me. I grew up being taught God loved me and had a wonderful plan for my life. Despite the fact that the churches I attended growing up had an intellectual idea that choosing to follow God didn't mean your life would be easy, we still felt that God had a plan for us and meant good towards us. I have changed a lot in my theology over the years. I don't think being a Christian means I'm exempt from certain kinds of suffering, or that I'll know things are going to end up a certain way. I don't think God is going to tie things up in a nice tidy bow for me. The only promise I really believe I have from God is that I will never be alone. I may feel alone, but I won't be. It's impossible to look at the world and it's massive amounts of suffering and think there's a chance I might be exempt from starvation, violence, disease, or poverty. Yet it's so easy when you believe in God to believe He is coordinating events. When things go well or as we'd like, it's easy to want to think that God is bestowing a favor upon us--that this is His plan. And perhaps sometimes it is. But if God is coordinating the good in our lives, it must also mean he's behind the suffering, the difficult times, the hardships. And we can believe He has a purpose in all of it (which I do though I don't expect to EVER know the reasons for it this side of heaven), but we have to be willing to accept that we might not ever know it and that it might not be about us. Or we can see God as hands-off, a deity who knows us intimately, but still lets us fall. Sorry for the long tangent, but that's much of what The Sparrow explores. How does a person of religious faith interpret the events of their life--especially when they are doing what they are doing for the service of God? What weight does their belief have on their decisions and actions? It's a big question, and it's not necessarily just for one who believes. Lack of belief also informs a person's actions. There are scenes in which Sandoz finds himself automatically thinking of God and trying to turn his mind away. This is something I have experienced....I don't know how not to believe. Even when I'm down or unsure or doubtful I believe in the midst of it all. God is always there, in my thoughts, in my heart. 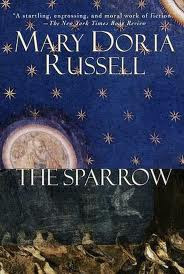 The Sparrow is a haunting, thought provoking book about the very core of belief. It's not for the faint of heart, it's a book that will make you both fall in love and shatter your heart. I do want to say that while this book explores questions of belief I think even if you have none it would be just as compelling, not all of the characters are of faith and the story is an interesting look at what could happen if we ever discover life on another planet. It's a book that raises questions and doesn't necessarily offer answers. Also, the book was published in 1996 and the events start in 2016...I'm not sure we'll have the technological advances Russell supposed we would have by then. I suspect this book will stay with me for a long time, and I will probably read the sequel soon. And the title is perfect.